Greycoat has just produced a series of proprietary Google Earth overlays for use by Holcim’s cement operations in Canada and the USA - November 2014. Greycoat has just produced a series of proprietary Google Earth overlays for use by Holcim’s cement operations in Canada and the USA. 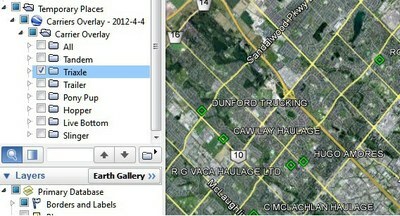 Greycoat has offered a service for producing and maintaining Google Earth KML/KMZ overlays for a number of years. Greycoat also offers Compass GEO, a map-based interface for quotations, planning and delivery quotations that can run standalone or as a module within Greycoat Compass Enterprise software. The image at right is from the Compass GEO software.